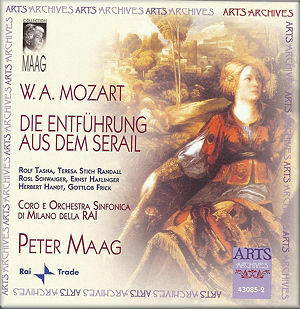 Peter Maag’s Mozart recordings had quite a reputation fifty years or so ago. His version of the Clarinet Concerto, with Gervase de Peyer and the LSO, introduced me to that work; it’s currently available at super-budget price from Australian Eloquence, with Spohr’s first and Weber’s second concertos (476 7404). Eloquence also have his classic recording of the Horn Concertos with Barry Tuckwell and the LSO (476 9700), Symphonies 28, 29, 32 and 34 and the Serenata Notturna (476 9692, OSR and LSO), Serenades Nos. 4 and 9 (476 9701, OSR and New Symphony Orchestra) and Symphony No.38, Lucio Silla Overture, German Dances and Thamos interludes (476 9702, with the LSO). All that is missing is the Notturno for Four Orchestras from his charming LP of serenades which used to be a regular visitor to my turntable in its Ace of Diamonds reissue, its other contents now split across these CDs. The Arts label, too, has been doing quite a lot to keep the memory of Maag’s stylish Mozart fresh, including a set of the late symphonies, recorded in 1996-7, which Jonathan Woolf described as paying rich and lasting rewards (47650-2 - see review). The operas, too, are receiving attention in the form of 1960s radio recordings refurbished on the Arts Archive label: Così fan tutte (43035-2), Figaro (43070-2) and Idomeneo (43063-2). Così and Figaro were very well received here and elsewhere - see review and review, Idomeneo slightly less so - see review. The glories of those earlier issues reside mainly in the strong casts - the well-known Rita Streich as Susanna and the much less well-known Heinz Blankenberg as Figaro; Teresa Stich-Randall as Fiordiligi disappointed Jonathan Woolf, but he still thought that her admirers would want the recording. Stich-Randall sings Konstanze on the new recording; here she is in altogether better voice, nine years before the Così recording, in 1958. She is joined by Ernst Häfliger as Belmonte, Herbert Handt as Pedrillo and Gottlob Frick as Osmin - a line-up almost guaranteed to provide satisfaction. The downside of hearing Stich-Randall when she was in much better form is that the recording was made in mono only. I’ll comment further on the recording later; suffice it to say that the 24-bit re-mastering has made it more than tolerable. For me, Die Entführung is the odd one out of the Mozart operas, the one which I’ve never fully come to terms with, even in one of the two classic DG recordings, with Eugen Jochum in command. The other DG classic, conducted by Karl Böhm is currently out of stock on CD in the UK, though it remains available as an mp3 download from passionato.com (429 8682) and the DVD version is still to be had (073 4075). Would the Maag recording be the one to convince me? I’m happy to report that in large measure it was, thanks to Maag’s sure direction and the quality of the singing. You only have to look at the cast-list to see that the three principals were among the finest of their day. Die Entführung has always seemed to me to have ideas above its station, to take itself a little too seriously for a mere Singspiel. In every respect except the recording, this Arts set convinces me otherwise. The engineers have done well in making the best of the sound, but it remains a little dry and restricted - not enough to put me off, but I would need an alternative in better sound, just as I love Beecham’s recording of La Bohème with de los Angeles and Björling but need sometimes to turn to the much better recorded Karajan with Freni and Pavarotti. Thinking that perhaps I’ve been listening to the wrong classic DG account, I downloaded Karl Böhm’s account from passionato and found myself just as taken with the work as I had been by the Arts version - and in much better sound. Three things in particular make that version so attractive: Böhm’s sure direction and the singing of his Konstanze and Osmin, Arleen Augér and Kurt Moll respectively, with Peter Schreier’s Belmonte not far behind. The early-1970s recording sounds well in decent mp3 sound; only in the ensembles does it sound a trifle ‘busy’. I don’t imagine that either the Maag or the Böhm will feature as often in my listening schedule as Zauberflöte, Figaro or Don Giovanni, but they have, between them, reconciled me to a work which I had written off. I’ll take the end of CD1 and the opening of CD2 to illustrate the virtues of the two sets. Both end CD1 with the close of Act 2, Konstanze’s aria Martern aller Arten (Nr.11). Maag takes this marginally more quickly than Böhm but the difference is hardly noticeable. It seems impossible that anyone could sing the aria more beautifully than Augér for Böhm, yet without sublimating the dramatic import of the words to the beauty of her singing. Stich-Randall’s German diction is much clearer than Augér’s, her singing just as beautiful, though I think she might have wanted to retake the aria, given the luxury of a studio recording. The dramatic nuances of the words are conveyed just that little more effectively, with Maag aiding her just that little more subtly than Böhm. I associate Stich-Randall more with Bach and Handel, but her singing here makes me wish she had recorded more Mozart, and in better sound. Choice is really impossible: ideally, one wants the impossible - the virtues of the two in combination. The Arts recording at first sounds noticeably thin in direct comparison and the ear never fully adjusts - by 1958 recordings from the likes of Decca and EMI and even the BBC were much better than the sound captured by the RAI engineers. Jochum, whose Konstanze is Erika Köth, takes the aria faster than either Maag or Böhm; neither the singing nor the direction can quite match either and, though the mid-1960s recording is certainly much better than Maag’s, it sounds a trifle thin by comparison with Böhm’s. Jochum had the peerless Fritz Wunderlich as his Belmonte; his singing in Hier soll ich dich den sehen is heart-meltingly beautiful and the set is offered inexpensively, typically for around £9, but in other respects this version yields to its rivals. Böhm opens CD2 with the spoken dialogue between Blonde and Pedrillo, followed by their arias, Blonde’s Welche Wonne, welche Lust (Nr.12) and Pedrillo’s Frisch zum Kampfe (Nr.13), all of which Maag omits. Some of the spoken dialogue is tedious - for that reason, among many others, I usually prefer to listen to Die Zauberflöte in Klemperer’s dialogue-free EMI recording - but the two arias are a considerable loss. The cuts inflicted by Maag on CD2 are considerable, reducing what takes 62 minutes on the Böhm set to a mere 41. The effect is to speed the resolution but at the expense of dramatic credibility and with the loss of some fine music. The ensuing dialogue between Pedrillo and Osmin is much abridged in Maag’s version, which is no great loss; Böhm also abridges it slightly, but in both the essence is retained. In both versions the Pedrillo-Osmin duet (Nr.14) is brought off well. Between the two Pedrillos and the two Osmins, there is very little to choose. Perhaps Gottlob Frick as Osmin on the Maag recording just has the edge here and in the final scene, though there’s little to choose between him and Kurt Moll in Ach, wie will ich triumphieren (Nr.19). Perhaps, too, Böhm’s Pedrillo has a slight edge, if only because Maag’s cuts reduce his role and that of Blonde. I also score Belmonte’s aria Wenn der Freude Thränen fliessen (Nr.15) and, indeed, the whole of his role, about equal between the two recordings, neither of them far behind Fritz Wunderlich on the Jochum set. For some reason, Maag reverses the order of Nos. 15 and 16, placing the Konstanze-Belmonte-Blonde-Pedrillo Quartet, commencing Ach Belmonte! Ach mein Leben! first. The voices of the two sets of singers blend well in the ensemble sections. Indeed, I find little to choose between the two pairs of lovers from this point to the end of the opera. If I score CD1 a draw and CD2 in Böhm’s favour, it’s mainly because of Maag’s excessive pruning and tinkering. The omission of Belmonte’s aria Ich baue ganz (Nr.17) is a particularly unfortunate loss. Though Arts include the German text, the lack of an English or French translation will be a handicap for many - the brief synopses in these languages are no real substitute, especially as some of the dialogue contains archaic colloquialisms and the Arts booklet retains such antiquated 18th-century spellings as seyn for sein. There are occasional minor misprints - war’s instead of the subjunctive/conditional wär’s, for example - and some of the stage directions are not printed in italics, so that they appear, confusingly, as part of the text. The libretto is not keyed to the CD tracks, all of which amounts to a rather sloppy presentation for a set offered at a price greater than that of the Böhm when it was available. All of that is better than the passionato download - no access to texts there. Download providers will really have to address this issue, when they charge almost as much as, or even more than the equivalent CDs for their downloads: were the Böhm CDs readily available, as they surely must be again, passionato’s download charge of £15.99 would be roughly equivalent to the price of the physical discs, with all their documentation, making the CDs clearly superior. There are several versions of the German libretto online, though none quite matches the slight abridgement of the dialogue. If forced to a straight choice between the Arts/Maag and DG/Böhm sets, I’d be strongly tempted to choose the former for the quality of the singing and direction. The Böhm set has come in for some criticism for employing actors in the spoken parts, but I cannot say that I am particularly troubled by this. I could be happy to live with Maag as my version of choice, but, ultimately, I have to plump for Böhm; the singing and direction are little, if at all, inferior to Maag’s, there are far fewer cuts and the stereo recording, still sounding fresh, is superior to Maag’s decent mono. If and when it returns on CD - it’s still listed in DG’s general European catalogue - its superiority will be increased. Meanwhile, it’s very well worth downloading as a stopgap measure. I'm grateful to one of our readers for pointing out that Maag does not omit Welche Wonne, welche Lust! and Frisch zum Kampfe! What confused me was that as part of his tinkering with the order of numbers he re-arranges the scenes of Act Two, placing Scenes 6 and 7, which contain these arias, between Scenes 1 and 3 and re-numbering them Scenes 3 and 4. Thus these arias precede Konstanze's Martern aller Arten, upsetting the balance of the music and action, but allowing CD1 to end powerfully with Konstanze's dramatic aria. The relocated arias are well sung - Konstanze's even better - and I'm sure that our reader, who has already ordered his copy of the set, will not be disappointed with his purchase. His query gave me an excellent excuse to listen again with enjoyment - elderly mono sound and Maag's tinkering with the order of the numbers notwithstanding.